David Price initially captained Schneider’s 2017 Ride of Pride military tribute truck, naming it “The American,” but when David switched to a role on Schneider’s field recruiting team in April, it opened the door for a new driver. 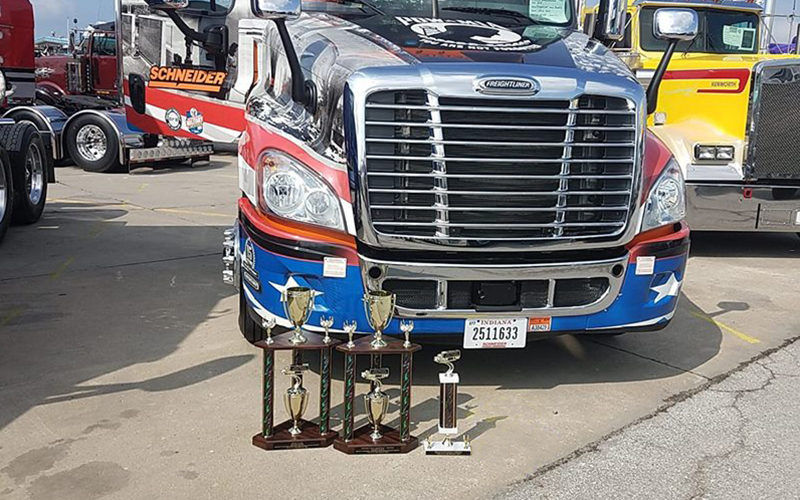 Another David, Air Force veteran David Buck, took over the keys, ultimately guiding The American to another prize-winning performance in a truck competition. Learn more below about David and the recent prize winnings. For David Buck, family is everything. That doesn’t mean they need to be blood-related, though. He formed a number of strong bonds throughout his 20-year Air Force career. 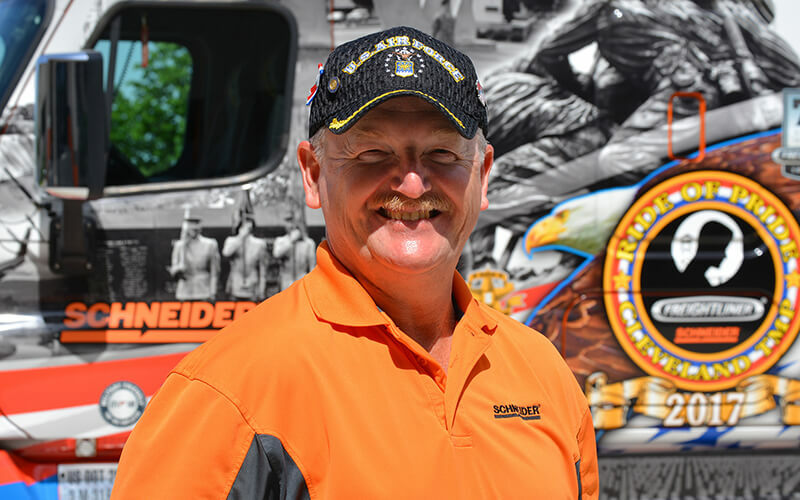 Now, David will feel that same support and connection on the road as Schneider’s 2018 Ride of Pride driver and will travel to various military-themed events throughout the country to meet millions who have military ties – blood-related and not. The military gene ran in David’s family from grandfather to father and uncle – and eventually to David. While David never felt pressure to follow in their footsteps, he found himself captivated by a firefighting display while exploring Chanute Air Force Base in Rantoul, Illinois, that made his decision to enlist an easy one. By the time David graduated from high school, he was lined up to become a firefighter in the U.S. Air Force. “It wasn’t something I felt that I had to do because of my family,” David recalls. Following multiple deployments over two decades of service, David retired to craft a new career path. He didn’t stray far from his military roots, accepting a job as the caretaker then gardener and later master gardener at Camp Butler National Cemetery in Springfield, Illinois. In 2015, David pivoted in a different direction. He talked with his wife about entering truck driving school to get his commercial driver’s license. It wasn’t long after he enrolled that a recruiter came around to talk about Schneider. David recalls being attracted by the company’s values. Along with a predisposition for safety, David’s Air Force background prepared him for the demands of being a truck driver, especially when it comes to staying persistent and meeting challenges with confidence. Since arriving at Schneider, David has logged more than 250,000 miles and a lot of memories to boot. The most memorable came earlier this year, when he received a call he was so sure would leave him feeling disappointed. While at an I-57 rest stop in southern Illinois, David returned the call to find out he had received the honor of being selected as the 2018 Ride of Pride driver. “I was honored in that moment,” David recalled. David picked up The American on April 21, just days after receiving the call, and began his role as the Ride of Pride driver by participating in events like the Rolling Thunder Freedom Ride and the Illinois Motorcycle Freedom Run. On July 12, David drove to the three-day Truckers Jamboree in Walcott, Iowa, which features a Super Truck Beauty Contest. Never having been to a truck show — let alone a truck beauty contest — David wasn’t sure what to expect. Even among nearly 100 beautiful trucks and antique truck displays, The American stood out — just as it did in 2017. The truck is decorated with decals depicting 17 historic military monuments and memorials from around the United States. The image that really resonates with David is of the Middle East Conflicts Wall Memorial in Marseilles, Illinois, which adorns the passenger side of the truck. When awards were given at the Jamboree, David didn’t have lofty expectations. What he experienced, however, was a remarkable honor: The American was awarded second place — Custom Graphics, Bobtail and second place — Show Class. Being the Ride of Pride driver has allowed David to meet new people, form fresh familial connections and travel to places he had never been before. From meeting World War II veterans to POWs from the Korean War, it’s the people, stories and interactions that make the experience so important to him. 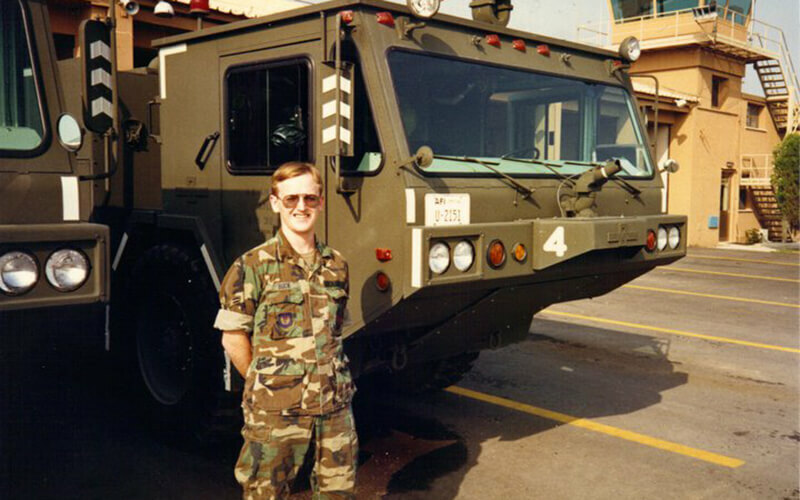 Are you a military veteran like David looking at a career in trucking? Fill out our quick military pre-qualification form today. Show your support and follow David’s journey by checking out the Ride of Pride Facebook page, as he visits with military veterans at events all across the country this year.